Essex County Anderson Park Travels Back in Time on Victorian Day - May 17, 2015 ~ The History Girl! The public is invited to this free event on Sunday, May 17th from 12:00 noon to 3:00 pm to sample pastime pleasures as they might have been during 1905 in this Olmsted-designed park, now on the National Register of Historic Places. Visitors are encouraged to spread out a blanket, unpack a picnic, and enjoy a leisurely afternoon. The event is sponsored by Friends of Anderson Park, the Essex County Department of Parks, Recreation and Cultural Affairs, the Montclair Historical Society, Bike&Walk Montclair, the Northern New Jersey chapter of the Victorian Society, the Montclair Cricket Club, and Studio Montclair. 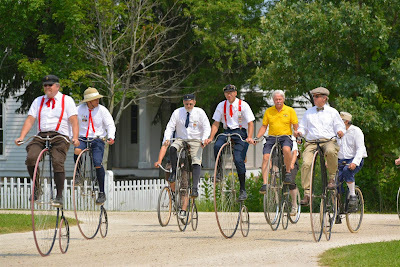 Members of The Wheelmen riding vintage high-wheel bicycles at an event in 2014. 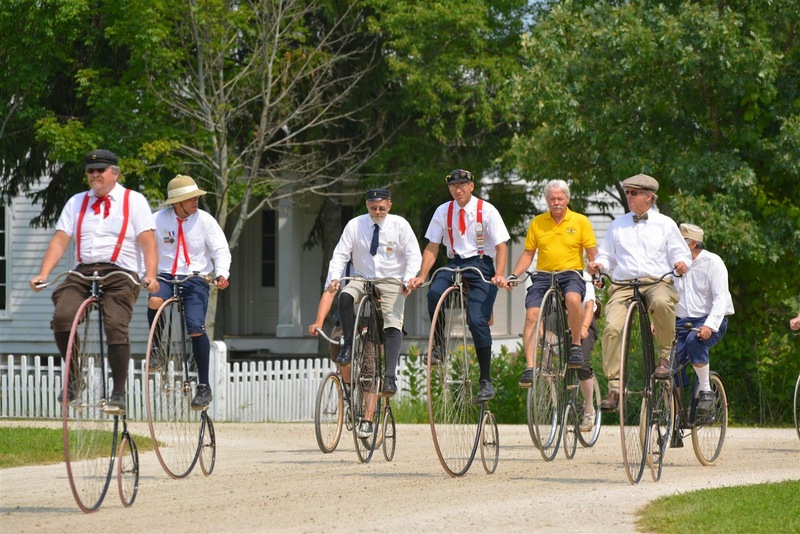 They will be displaying antique bicycles at Victorian Day in Anderson Park on Sunday, May 17. Courtesy The Wheelmen. “Essex County Anderson Park has an important role in Montclair’s history, providing beautiful open space for a range of recreational activities and influencing the development of other parks in the municipality. Victorian Day is an opportunity to showcase the history of the park and provide the public a glimpse of how it was used a hundred years ago,” Essex County Executive Joseph N. DiVincenzo, Jr.said. “We are pleased to be partnering with the Friends of Anderson Park and a host of community organizations to present this special event to commemorate the park’s 110th anniversary,” he noted. From 12:00 noon to 3:00 pm, Brian Nalepka of the Richard Stillman Band will be leading a lively Dixieland trio. One day before Victorian Day, on Saturday, May 16th starting at 10:30 am, the conservancy’s historian will lead a free walking tour of the park. The hour-long tour will describe how Anderson Park came to be, how it shaped Upper Montclair, and how it led to the formation of other Montclair parks. For the Saturday tour, meet at the boulder at the park's northeast entrance. Light rain does not cancel, but heavy rain reschedules the tour to Victorian Day (Sunday, May 17th) at 10:30 am. Essex County Anderson Park is located at 274 Bellevue Avenue, at the corner of North Mountain Avenue, in Upper Montclair. For more information about the May 16th walking tour or the May 17th Victorian Day, contact Friends of Anderson Park at 973-477-7207 or e-mail info@friendsofandersonpark.com. For more information about the Friends, visit www.friendsofandersonpark.com.